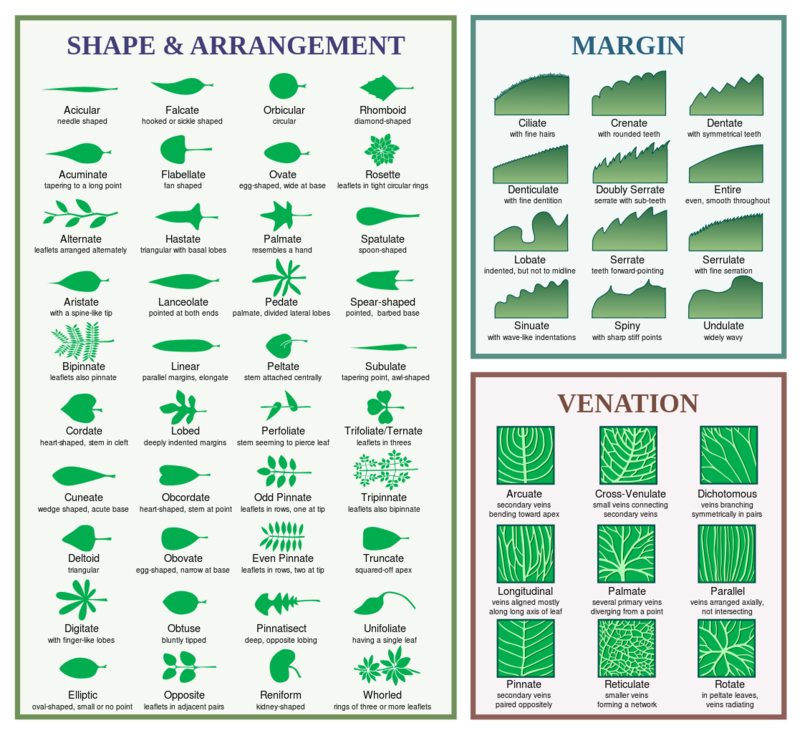 Learning some basic botanical terminology and horticulture will simplify wild and domesticated plant identification, as well as demystifying your herb garden and potential problems. Click for larger image. Image courtesy of Wikipedia. Adventitious roots – roots that develop on parts of the plant other than the primary root system, such as nodes or stems, seen on plants like ivy. Tap root – A long, tapering, primary root with small fibrous secondary roots. If left in the ground, these adventitious roots can for shoots to produce new tops of plants. Some examples of taproots are dandelion, burdock, beets, yellow dock, and carrots. Fibrous roots – These are composed of roots all of similar length and thickness, branch extensively, and never get woody. Most plants have fibrous root systems. Tuberous roots – Roots that have evolved and thickened to serve as food storage for the plant. Tuberous roots can grow a new plant from the root, such as dahlias and potatoes. Rhizomes – A creeping root-like stem that stores food for the plant similar to tubers, but when broken into pieces, can form new plants from each piece. Some examples are ginger, turmeric, and some euphorbias. To grow healthy, vibrant plants, you need to understand the medium they get all of their vital nutrients from – the soil. Plants are all different with which soils they do best in. Some love and thrive in nutrient dense, moist, organic soils, but some do best in dry, sandy, nutrient poor soils. By determining the texture of your soil, the pH, and nutrient levels, you can increase your plants’ production and vitality, and understand which plants will do the best in your garden. So first, we can start by understanding the basic physical makeup of the soil. Below, you can see that soil texture is categorized simply in this pyramid. Soil is essentially made up of different proportions of clay, sand, and silt. To determine the physical makeup, or SOIL TEXTURE of your soil, there are two easy tests you can do. 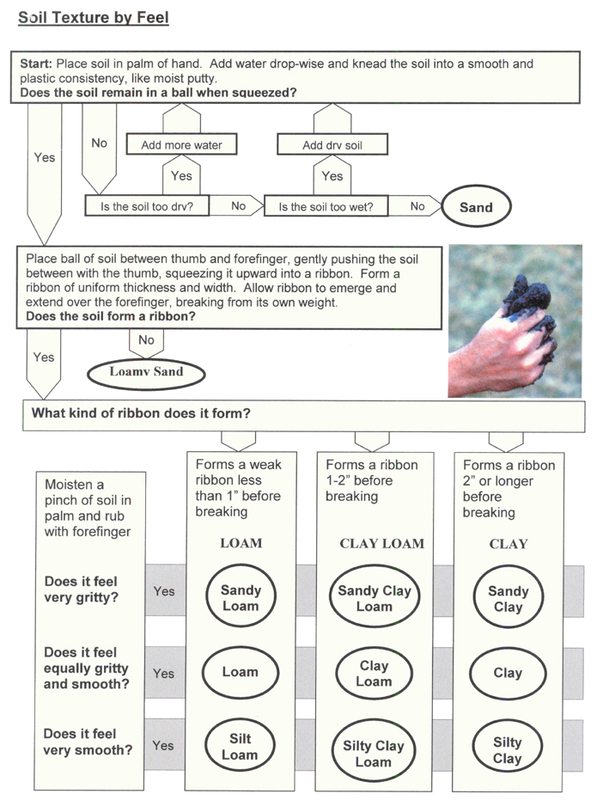 The first is the ribbon test; this will tell you what kind of soil you have. To do this, dig up a cup of soil from your garden. Take some soil the palm of your hand and begin adding water and rubbing it between your fingers, noting the texture. Sand feels gritty, silt feels smooth, and clays feel sticky. This will start to give you a basic idea of what kind of soil you have. From here, form a moistened ball of the soil in your hand. This flow chart below from Colorado State is an excellent guide to follow from here on out. You can also test the makeup of your soil with the mason jar soil composition test. This will give you a good idea of what proportions the clay, silt, and sand are in your soil. 1. Get a mason jar, and add a cup of soil from your garden. 2. Fill the jar about 3/4 full with water, and then add a drop of dish soap to help break apart larger clumps of soil. 3. Shake for 5 minutes! 4. The next day, the soil will have separated into layers, as seen below, giving you a good idea of what amounts of sand, silt, and clay is in your soil. SOIL pH – Some plants require alkaline soil (pH of above 7) and do best in acidic soils (pH below 7). You can find out the necessary pH for your plants at home though some research, but here are some compiled lists: Garden Express and Eutechinst. If you happen to have litmus paper around, you can get a more precise reading. To test if your soil is alkaline or acidic, you can do this quick and easy test with materials you probably have at home. 1. Take a few samples of your soil from around the garden. Your sample should include the topsoil to about 6 inches down. 2. Add a healthy scoop of soil to two different clean bowls. Pour vinegar over the first bowl. If it fizzes, your soil is alkaline, and you don’t need to continue on with the next few steps. 3. Add water to the second bowl until it is wet and muddy. Pour baking soda into this bowl. If it fizzes, it’s acidic. 4. Check back on both bowls. If neither have fizzed you have neutral soil, which is typically what most plants can grow well in. Most plants prefer neutral or lightly acidic soils. It’s good to note that compost is acidic, so if you have highly acidic soils, you might want to add some alkalizing agents such as wood ash to the soil before adding more compost. There is another interesting way to test your soils using red cabbage with photo instructions, as seen in this garden web forum. SOIL NUTRIENTS – In general, plants such as garden herbs and vegetables need ample nutrition to stay healthy and produce leaves, fruits, and flowers. This is a simple guidline to use when deciding on organic soil amendments and organic fertilizers. If you are shopping for a commercially prepared organic fertilizer, you may notice three numbers on the front of the box, such as “5-3-3” or “7-4-5”. This is the NPK (Nitrogen-Phosphorous-Potassium) ratio, the three primary macronutrients that your plants need. You can see from the chart above the Nitrogen and Potassium are important for leaf development and growth, and Nitrogen and Phosphorous are responsible for flower, fruit, root, and seed development. Calcium, Magnesium, and Sulfur are also secondary nutrients important to plant cell growth and structure. Typically, there is enough of these nutrients already present in the soil. Calcium and Magnesium are found in additives like lime (used for neutralizing acidic soils), and Sulfur is added to the soil through the decomposition of organic matter such as leaves and grass. There are eight micronutrients that plants need too, but only in small amounts: Boron, Chlorine, Copper, Iron, Manganese, Molybdenum, Zinc, and Nickel. These are also usually present in the soil from decomposing organic matter and compost. 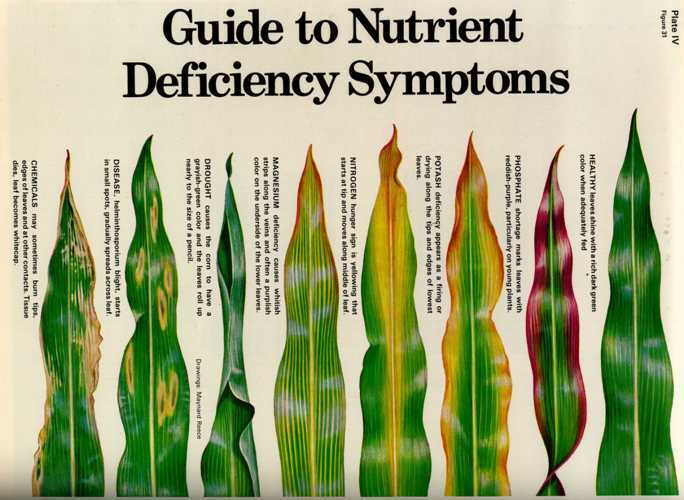 NUTRIENT DEFICIENCY –Plant nutrition is a complicated subject, but for basic reference, a quick chart might be able to clear up some problems. It is important to understand that there are biotic and abiotic stresses on plants. Biotic stresses are caused by living organisms and manifest as pests and disease. Abiotic stresses are factors caused by weather, man, or chemicals. When trying to figure out if your plant has a deficiency, it’s important to rule out the possibility of over-fertilization, accidental injury, pest, or disease. Typically, pests and injury have physical damage, with bite marks, broken areas, and pieces missing, while disease can appear to have an “edge”, as shown below. Chemical injury, such as spills or over-fertilizing, can also cause deficiency. From left to right: chemical, disease (which is not necessarily going to manifest as pictured here), Drought, Magnesium, Nitrogen, Potash, Phosphate, and a healthy leaf. Mycorrhizae are fungi that establish a symbiotic relationship with the roots of most plants. They live in the roots of vegetables, flowers, shrubs, and trees; connecting to them and sending their filaments, called hyphae, as much as 200 times farther into the soil than the roots they colonize. Mycorrhiza has the ability to reach into a wider area for water and nutrients, especially phosphorus, which it transmits back to the roots. The plant in return, supplies the glucose that the fungus needs. This increased nutrient collection area makes mycorrhizae associated plants significantly healthier, with better root formation as well as fewer root diseases and other soil pest problems. They also require less moisture and fertilizer, while showing an increased tolerance to salt. Soils high in organic matter and compost are best for the growth of mycorrhizal fungus. If you don’t already have mycorrhizae in your soil, you can inoculate your soil; however, some plants and mycorrhizae have specific relationships, and not all fungus will work on all plants. Typically, if you buy a mix, it will contain several kinds, and one will match the plants you have in your garden. Tilling and hoeing your soil can rip apart the delicate mycorrhizal lace, which can then take months, or even years, to reestablish. Synthetic fertilizers, pesticides, and fungicides will also damage the mycorrhizae. The practice of solarizing – where a layer of plastic is laid down to use the heat of the sun to kill weeds and insects – also kills the soils mycorrhizae. There are many beneficial insects you can introduce to your garden, either by purchasing them at a local nursery or planting pollinator plants that attract them. These help keep down the pests that will chow down on your herbs at bay and encourage a healthy garden. Check out UC Davis’ Integrated Pest Management for help with identifying and solving pest problems with no or low chemical use. IPM is a great, realistic approach to dealing with garden pests that doesn’t rely on gnarly pesticides. My favorite way to get rid of aphids in the garden is a mix of mineral oil infused with tons of garlic. After letting it sit for a week or so, it’s going to smell pretty intense. Add a little water to the mix and shake, so that it will spray through a spray bottle, and mist your plants affected by the aphids. Be sure to set out ant traps while the garlic is macerating, since ants farm the aphids for their honeydew. Once the ants are gone, the aphids will have no backup. From here, you can release ladybugs or lacewings into the garden (make sure the ants are gone or you will have to watch a brutal battle), who will hunt and eat the aphids. Don’t get the garlic spray on the lady bugs! I like to spray, then wait a few days for the garlic oil to wash off before letting the ladybugs loose.